Rice is a common source of carbohydrates and is available in white and brown varieties. The quality of carbs in rice and other foods can be measured by the GI, or glycemic index of foods, which is the assignment of a number between 0 and 100, depending on a food's effect on blood sugar: the higher the number, the more negative the impact on blood sugar levels. If you are diabetic or on a low-GI diet and consume rice, you may want to consider the differences between the GIs of brown rice and white rice. Cooked short-grain white rice has 130 calories and 29 grams of carbs per 100 grams, while medium-grain brown rice has 112 calories and 24 grams of carbs, according to USDA National Nutrient Database. Carbohydrates are an essential part of your daily nutrition, giving you the nutrients needed to support your body’s functions and providing you with enough fuel for energy. Carbohydrates are found in many foods in the form of starches, sugars and fibers. Grouped into two categories, carbohydrates include complex carbohydrates, which are starches, and simple carbohydrates, which are sugars. The starches and sugars are digested and broken down into glucose, your body’s primary fuel. Fibers, both soluble and insoluble, are not digestible and pass through your digestive system. Fiber is necessary for digestive health even though it does not supply nutrients. Brown rice has more fiber, with 1.8 grams per 100 grams, as compared to white rice, which has less than a gram. All carbohydrates are not digested by your body at the same rate. A way to measure the digestibility of carbohydrates is by using the GI. This index measures the changes in blood sugar levels after you eat a particular food. Foods that cause large increases in blood sugar levels have a high GI, while those that don’t cause large increases have a low GI. Typically, foods that contain sugars rapidly boost blood sugar levels and so have a high GI, whereas starchy foods are digested more slowly and tend to have a lower GI. According to Harvard Health Publishing, cooked white rice has an average GI of 73 and the average brown rice glycemic index is 68. Although the GI is a good guideline, it only measures the effect of a small amount of food, usually 50 grams of carbohydrates, over a period of two hours. The glycemic load (GL) takes into account the GI of a particular food and also its portion size. The rationale is that a small amount of high-GI food would have the same effect on the body as a larger amount of low-GI food. The GL is calculated by taking the GI of a food, multiplying it by the amount of carbohydrates in grams and dividing that number by 100. Understanding the GL is useful for diabetics and others needing to monitor the quality and quantity of food that they eat. White rice is the same plant as brown rice, but white rice is actually only the inner part of the rice grain. A milling process removes the indigestible outer hull and the bran, leaving only the starchy white endosperm. Because the milling process removes vitamins from the rice, in the U.S., most white rice has B vitamins added back into it. 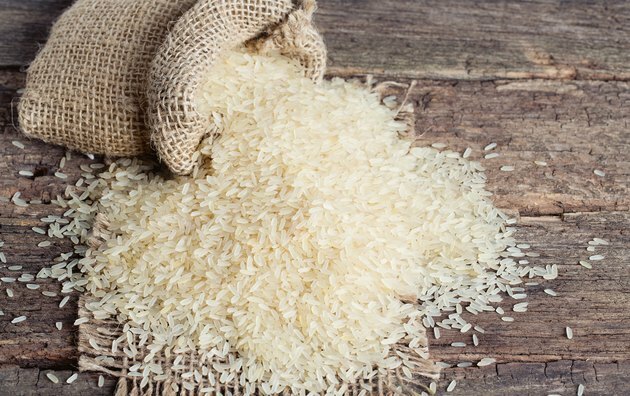 The way rice is processed or cooked can make a difference in its GI. The longer you cook any rice, the higher its GI rating will become, advises Your Diabetes Hub. Converted long-grain white rice has a lower GI than that of brown rice, but short-grain white rice has a higher GI than brown rice, says the American Diabetes Association. Basmati, wild rice and brown rice GIs are listed on the medium GI list (56 to 69). Short-grain white rice is listed as a high-GI food (above 69). Read more: Is White Rice Unhealthy? Brown rice is less processed than white rice. The rice grains have the outer hull removed, but the underlying bran and germ layers are left on the grain. The bran layers are what make the rice brown and more nutritious than white rice because the bran contains vitamins, minerals and oils. It also has more fiber than white rice. Brown rice is sometimes called whole-grain rice and is a better food than white rice because of the additional fiber and nutrients it contains. Since a larger amount of fiber contributes to fullness, you may feel satisfied with a smaller serving of brown rice for a lower GL. Read more: Which Rice Is Healthiest for Consumption? Substituting brown rice for white rice not only increases the amount of fiber and other nutrients in your diet but has been shown to be a better choice for diabetics, who need to be concerned about the GI of foods. A randomized control trial demonstrated the effects of replacing white rice with brown rice in 15 overweight adults. The findings, published in Diabetes Technology & Therapeutics in 2014, showed that the group that consumed brown rice experienced a significant beneficial effect on glucose and insulin responses. The conclusion of the study suggested that brown rice offered overall health benefits by reducing the risk of diabetes.